Andreas Oberg’s sophomore release on Resonance Records Features All-Star Lineup of Musicians. Oberg leads the Andreas Oberg Guitar Universe online learning program. Students can study any of the 125 lessons on the Andreas Guitar Universe site and submit a video for me to review and respond to. It doesn’t matter whether I am on the road or at home, the video technology allows me to keep in touch with my students. 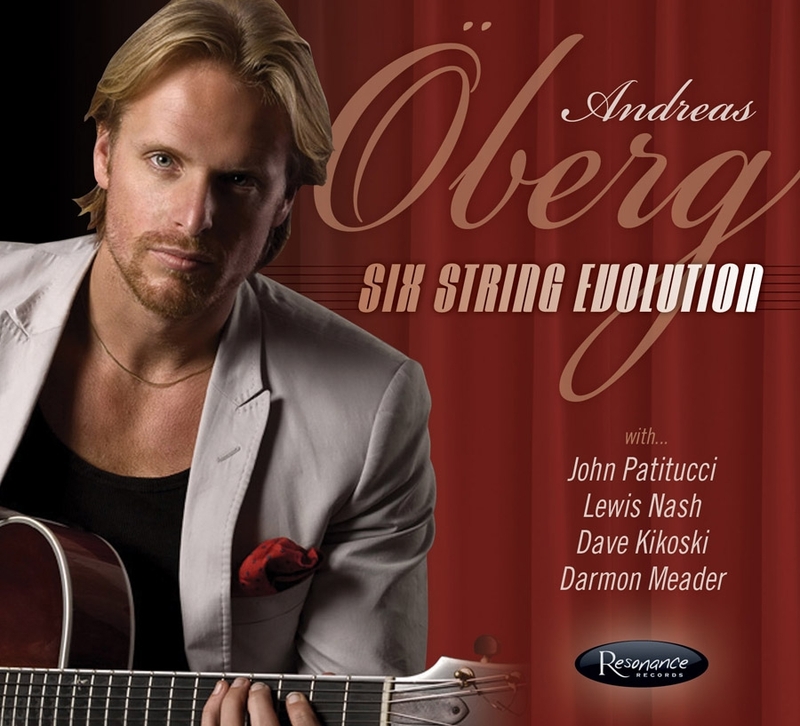 ArtistWorks, Inc. (AWI) Guitar virtuoso Andreas Oberg, leader of the Andreas Oberg Guitar Universe, has released a new recording, Six String Evolution, on Resonance Records. Produced by George Klabin and Joe Donofrio, Six String Evolution presents the Swedish guitarist in the company of heavyweight players from around the globe. They include pianist Dave Kikoski, bassist John Patitucci, drummer Lewis Nash, singer-saxophonist Darmon Meader, and several others. Song excerpts and a complimentary bonus track from Six String Evolution can be heard here. In 2009 Oberg launched the Andreas Oberg Guitar Universe, a revolutionary online teaching site open to guitarists at all levels of proficiency. “Students can study any of the 125 lessons currently on the site, then upload their practice video for me to review,” Oberg explains, “It doesn’t matter where I am, whether on the road or at home in Sweden, the video technology allows me to keep in touch with my students.” For those who purchase Six String Evolution via ResonanceRecords.org, a special discount code will be provided for six months of enrollment in the AGU for $60 (enrollment is normally three months for $60). Oberg will be touring the US, performing on June 7 at Dizzy’s Club Coca Cola at Lincoln Center in New York, June 8 at the Washington DC Jazz Festival, and June 11 at the Rochester NY Jazz Festival. For more information on Andreas Oberg tour dates and his new release, please visit Resonance Records at http://www.resonancerecords.org/andreasoberg. Andreas Oberg is a native of Sweden and is a graduate of the Royal Music Academy in Stockholm. Andreas has quickly become one the fastest-rising guitar sensations in the world, recording and touring throughout the US, Europe, Sweden and Asia. He is one of the famed “Benedetto Players” and is a Resonance Records artist. He now presides over the Andreas Oberg Guitar Universe, teaching online students worldwide. More than a hundred and twenty-five guitar video lessons covering Guitar Basics, Tricks and Techniques, Jazz, Basics, Jazz Advanced, Gypsy Guitar and more are available to students from beginner to advanced, covering styles including Jazz, Rock, Fusion, Gypsy, and Blues. The extensive video curriculum is presented on the innovative ArtistWorks online platform, allowing Oberg to use ArtistWorks’ Internet video-exchange technology to break the barrier of one-sided learning. Students are able to access multiple versions of most lessons, including “slow motion” videos to enhance the learning process. The AGU incorporates fully featured social media, uniting the world of jazz and gypsy guitar players in one central place. Enrollment is $60 for three months of instruction. The Andreas Oberg Guitar Universe resides at http://www.andreasguitaruniverse.com. The ArtistWorks online visual education format allows virtuoso musicians to “Teach the World” by presenting their full method, technique or curriculum in HD video to subscribing students of their sites. Simple webcams are used by the students to submit videos to the Artist through the site, for critique and guidance if they want personalized instruction. The Artists manage the video flow by using the Video Management System created and owned by ArtistWorks, Inc. (patent pending). Regardless of whether or not students participate in exchanging videos with the Artist, these “video-exchanges” are posted for all subscribing students to learn from. This groundbreaking use of video-exchange for the instruction of musical instruments has been implemented at Jimmy Bruno Guitar Institute, the Qbert Skratch University, Andreas Oberg Guitar Universe, Peery Piano Online, Tony Trischka School of Banjo, Howard Levy Harmonica School, and the new Martin Taylor Guitar Academy. Learn more at http://www.ArtistWorks.com.